Açorda is a traditional Portuguese bread soup perfect for the cold winter days. Açordas historically originated as a very popular meal in rural areas. They combine typical Portuguese rustic bread with Mediterranean ingredients like olive oil, cilantro, garlic into a wonderful dish that can be substituted with pretty much any type of meat and always taste delicious. 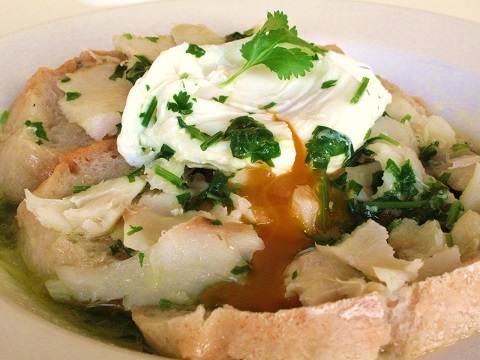 Açorda de Bacalhau, or codfish bread soup, is a signature Portuguese bread soup that combines cod fish traditionally cooked alongside some garlic flavored mashed bread, eggs and chopped olives. It is a very easy to make dish that can be whipped up in no time and is always sure to impress, especially when serving with some guests. 1) Prepare the cod by soaking it in a bowl of cold water for at least 12 hours, changing the water three times every 4 to 6 hours. 2) Once the cod is ready, add it to a saucepan with 2 cups water on medium heat. Let it cook until the cod fish is cooked and well softened. 3) Then remove the cod fish from the pan and place it in a bowl. Now remove the skin and bones and break the codfish apart into small pieces. 4) In the sauce pan with the cooking water, add the bread to soak it. Once the bread has softened a bit, remove it and place it in the bowl alongside the cod fish pieces. 5) Saute the chopped onions, garlic, and bay leaf in a large frying pan with the olive oil on medium heat. 6) Once slightly browned, add the cod fish, bread, and salt and pepper to taste. Stir it well as it cooks. 7) As it cooks, poach the four eggs in a saucepan with water. 8) Once done poaching the eggs, place them on top of the pan with the codfish. 9) Now garnish with the chopped cilantro and remove the pan from the heat. Serve in the pan immediately while hot.